Home MTAANI NEWS This Was Wainaina’s First Mission As Thika Town MP. This Was Wainaina’s First Mission As Thika Town MP. Grace Njoki Wanyoike, a potato trader at Madaraka Market celebrates her freedom after Eng. Patrick Wainaina secured her release from Makongeni Police Station in what seems to be politically instigated. Njoki had spent the night in the cells. The next chapter in Thika politics began on Wednesday with the announcement of Eng. Patrick Wainaina Wa Jungle as the MP-Elect and it continued Saturday on the streets of Thika when his “Thanksgiving” caravan snaked through all the wards. After a lengthy and fiery campaign based around lots of promises, the MP-Elect expressed confidence that his tenure would bring good results to the people of Thika, saying that his would servant leadership and he would dedicate all his efforts to working for the people. He promised to work with all the elected leaders and wanted an open dialogue with all those who he beat in the just concluded elections to ensure that the constituency was restored back to its heydays. “For quite a very long time, only a few reaped the rewards of government while Wanjiku borne the cost. Thika flourished, but the people never enjoyed a share in its wealth. This is your moment. This carnage of poverty, helplessness and a stagnant economy must stop and will definitely stop now,” Wainaina told the people of Kiganjo Estate. At Madaraka Market, Wainaina appealed to the traders to forget their political differences and unite for the good of every one of them. He told them that he would sit down with the elected Kiambu leadership to see to it that all the contentious issues that had been bedeviling the market were resolved. Answering a request by the traders, the new MP promised to start work to put up a toilet in the market and help clear the garbage within the next two weeks. 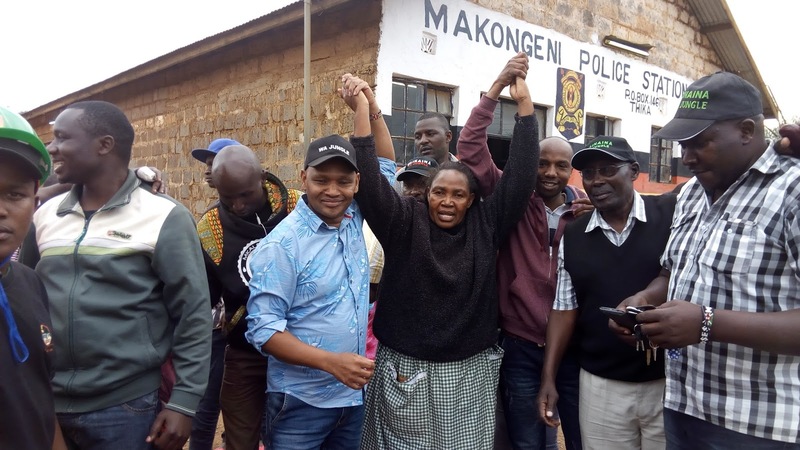 Wainaina stunned friends and foes when he stormed Makongeni Police Station to demand the release of one Grace Njoki Wanyoike, a potato trader at Madaraka Market who had been put in the cells allegedly for political reasons. “Yesterday (Friday), I was thrown out of the market and my potatoes scattered on the road before being bundled into a police vehicle and thrown to the cells. My only crime was that I did not vote for their preferred candidate,” said Njoki. Wainaina noted that it was quite unfortunate that at this age and era, some people were still practicing retrogressive politics of intimidation and harassment. He promised to work with other leaders in a bid to square out all the differences and ensure Madaraka Market accommodated all people without discrimination. “It is time for the people to embark on nation building. The time for politics ended on the 8th (of August). We need now to be preoccupied with issues of how best we can improve the market and make it more business friendly not wasting our time with political infighting,” said the MP–Elect. Wainaina’s convoy later visited Kisii Estate, Landless, Gatuanyaga, Ngoliba, Ndula, Gachagi and Umoja Estate, before winding his tour at Township and Karibaribi. In Ndula, he promised to continue working on street lighting and improvement of the road infrastructure where he said that he would try his level best to ensure that every region within the constituency was habitable and accessed all the essential government services.